The 10 Best Water Shoes for Rocky Beaches, Kayaking & more! If you enjoy water sports you need the best water shoes on the market. These versatile shoes provide many benefits and are designed to protect your feet, especially when walking on rocky terrain. They offer great traction as well as foot and toe protection. The top water booties will have a closed toe and will cover a large portion of your top foot, these features ensure you are protected from unseen dangers in the water. We take a look at the top water shoes and consider the kind of traction they offer as well as toe and foot protection, both top and bottom, as well as how efficiently they work out of the water. Snow more your thing? Check out our review of the top snowshoes here. We consider how difficult they are to put on and take off, what type of material they are constructed from and what type of sole they have. View the Best Shoes for Water, Below. Top Water Shoes for Beach? Top Water Shoes for Kayaking? All of these aspects have a profound impact on the effectiveness of the water shoe and are important features to consider when deciding which one is best for you. This is one of the best water sandals there is with a mesh upper that is easy to clean and highly flexible, they are built to handle any environment and can be used both in and out of the water. Extremely lightweight, weighing only mere ounces they will not weigh your foot down when wading through water, and the hook-and-loop closure of the sandal will ensure that it stays on your foot keeping it snug and safe at all times. The uppers are designed with ports, which will shed the water and any debris easily; they are also flexible to allow a great range of movement in your foot as well as being soft to provide comfort when walking. 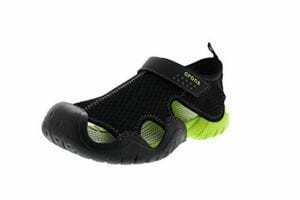 The Croslite foam construction of the shoe is engineered not to absorb water and the rubber outsoles feature herringbone grooves, which will provide the kind of traction needed when taking on any water sports or water activities. The fit of the shoe is comfortable, with little extra room so that it holds your foot snugly. These water sports shoes are very quick to dry, easy to clean and also offer odor resistance to ensure that your foot and shoe stay fresh throughout. A water shoe that will not only keep your feet fresh with its odor-resistant qualities, it will also protect your feet keeping them snug, safe and comfortable. Croslite foam construction allows it to shed water and debris with ease with the herringbone grooves in the rubber outsoles offer superb traction. Lightweight and easy to clean. 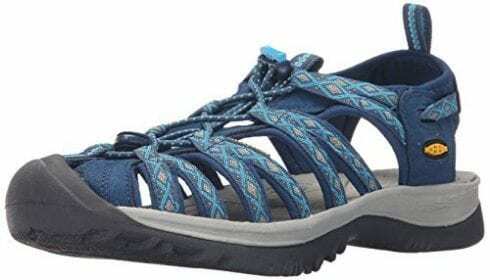 If you love to hike on trails that involve crossing creeks or rivers, wading through swamps or talking any other kind of water on your hikes, then you need these top rated hiking blaze sieve water shoes. You may have been looking for a pair of water shoes for hiking for some time! The upper is constructed from a waxy leather fabric with lycra which is not only waterproof but also highly flexible, this allows your foot a great range of movement so you can tackle those difficult to traverse rocky trails with ease. The Blaze sieve water shoe is extremely lightweight and has a lug depth of 3mm offering superb traction on any terrain. The Unifly midsole will ensure that you maintain contact with the ground keeping you stable on your feet while the outsole protects your underfoot from dangers. The open design of the shoe enhances its ability to allow water and debris to shed. Putting on and removing the shoe is easy with the Neoprene stretch collar and the M-Select Fresh antimicrobial agents in the shoe will help to reduce any odor. 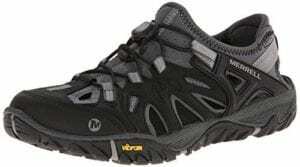 Easy to clean, easy to wear and with a responsive flexible upper and sole, this is one of the best hiking water shoes. Lightweight, flexible and comfortable this is the water shoe you need when tackling hiking trails that involve water crossings, the waxy leather upper allows the shoe to shed both water and debris, Unifly midsole keeps your foot stable and in contact with the ground and the neoprene stretch collar allows for easy on and off. 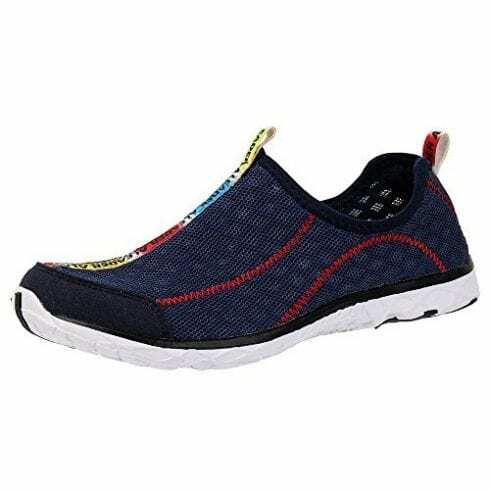 This mesh slip on water shoe is constructed with lightweight mesh material upper provides you with not only a quick-drying shoe but also a very breathable one that allows your feet to keep cool. The shoe is engineered to be amphibious and can be used in both wet and dry conditions. The hydrophobic properties of the mesh with a stitched lateral support system which locks your foot down into the shoe to ensure that it stays secure at all times whether you are in or out of the water is what makes this a great water shoe. FluidFlow technology ensures that the shoe will dry quickly with excellent drainage through the outsole. Solyte midsole gives you excellent energy return and is extremely lightweight. The ComforDry sockliner provides for optimal cushioning and will ensure that your foot remains cooler and drier than in any standard athletic shoe. Traction is vital when walking or running on wet slippery surfaces and the rubber pods that are placed in the high wear areas of the sole along with the water grip outsole provides you with the best traction available in a water shoe. Offering outstanding features with a mesh upper that is lightweight with FluidFlow technology that helps to shed water and other debris so your pair of shoes do not weigh you down. The Solyte midsole and ComforDry sockliner keep your foot cool and comfortable and the Water grip outsole with rubber pods offers superb traction, it is one of the best on the market. This water sandal for women offers a host of features that ensure your foot remains cool, dry and secure when participating in water sports. The Cleansport NXT also helps with odor control, which is a problem with wet shoes. Keeping your feet securely in the shoe is the bungee lace captures system and the hydrophobic mesh lining keeps your feet dry and cool for hydro comfort when performing hydro sports. The midsole is molded EVA and the footed has a metatomical footed design offers a support mechanism that is anatomically engineered to provide the best arch support and to mold to the natural contours of your feet. The TPU shank of the water shoe keeps your foot stable while the patented toe-protection ensures is specifically designed for women to ensure their toes are protected at all times. The multi-directional lugs on the outsole of the water shoe provide superb traction under any underfoot conditions. The shoe is completely machine washable and fast drying. Perfect for the female outdoor enthusiast and with a great price you cannot afford not to consider this water shoe for all your watersport needs. A water shoe specifically designed with women in mind with a Cleansport NXT design for odor protection, metatomical footed design, great toe protection, molded EVA midsole and TPU shank for superb comfort. The multi-directional lugged outsole offers outstanding traction wet and slippery surfaces. The bungee lace capture system ensures your foot remains securely in the shoe. A superbly lightweight water shoe for women that offers great durability, flexibility, and comfort for the lady that enjoys the great outdoors. The air mesh upper offers excellent airflow allowing the foot to breathe and the Solyte midsole and ComforDry sockliner offers optimal padding and cushioning to enhance the comfort of the shoe, it also helps to drain the shoe making it cooler and drier than other boating shoes. Along with the open mesh upper on this water shoe, you get a mesh hole in the sole, which aids the shoe to dry quickly. The slip-on shoe is amphibious and loves the water with hydrophobic engineering to ensure that your shoe does not become waterlogged, this along with the lateral support system which locks your foot down, you are ensured that your foot remains secure and protected at all times in the water shoe. 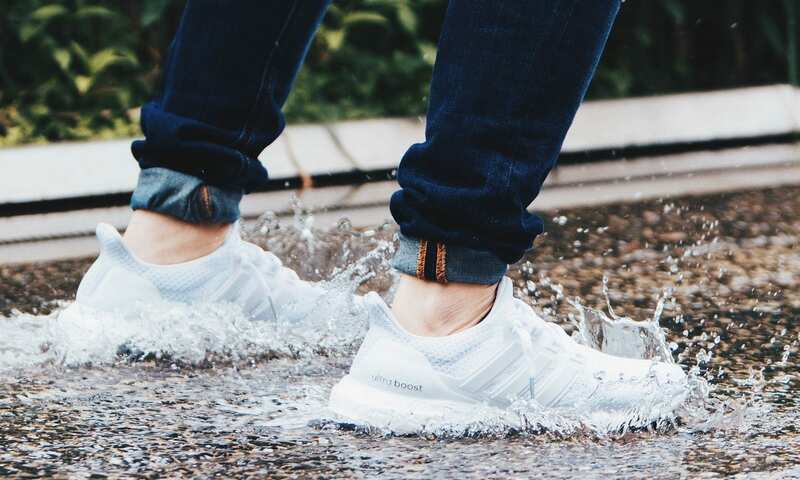 The FluidFlow technology of the shoe prevents it from becoming waterlogged as it allows the shoe to drain freely. This is an all-purpose shoe with excellent traction; including rubber pods that are placed in the high wear parts of the soles for additional traction. 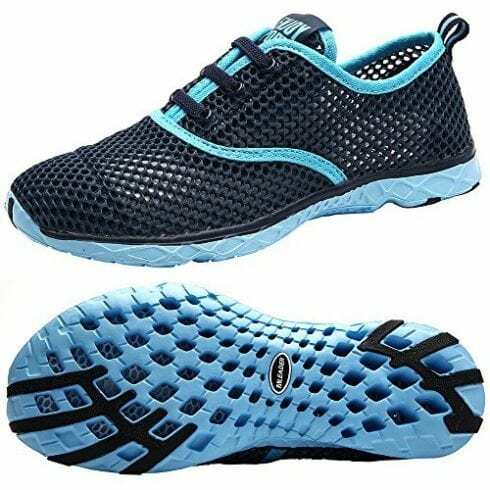 A womens water shoe that provides a superb level of comfort and protection with a Solyte midsole and ComforDry aqua sock, while ensuring that your shoe drains properly with the FluidFlow technology. Your foot remains securely in the shoe with the lateral support system and the open mesh upper allows for breathability. A fantastic women's swim shoe made from mesh and synthetic materials that are chlorine resistant. This cross training is perfect for in and out of water use. The footed is perforated with added drainage ports situated in the sole of the shoe; the nitracel footed allows the shoe to dry out quickly. The webbing midfoot cage will provide the support for both your lateral and medial foot. The sole of the shoe is highly flexible to allow for a full range of movement and it includes an added drainage system, which along with the mesh upper ensures that this water shoe can shed water and debris. The outsole of the shoe is made from sticky rubber; this ensures the best traction no matter if you are walking on slippery and wet surfaces around the swimming pool or on the beach. The shoe is designed to be put on and removed quickly and easily, it is lightweight and will not weigh you down and become waterlogged. This is a great beach water shoe for women that have all the features you need to keep your feet dry, cool and protected. Nitracel footed with perforations for added drainage, webbing midfoot cage that offers lateral and medial support and a sticky rubber outsole for superb traction in wet and dry conditions. 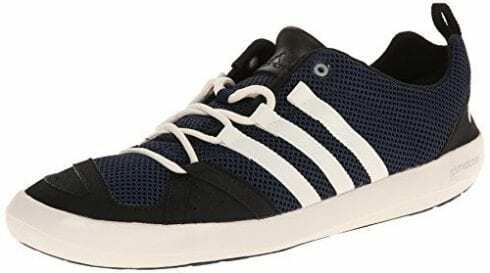 One of the top mens water boating shoes for hiking the Adidas Climacool Boat lace offers an open mesh upper for the best breathability and a shaft that measures around 2" from arch. It is constructed from 5 - 10% recyclable non-visible content and is environmentally friendly. 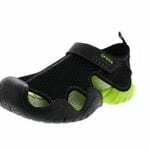 The EVA tongue of the shoe enhances the fit and the comfort of the shoe with a stretchable heel insert, which ensures that this water shoe will mold to your foot keeping it stable and comfortable no matter the type of walking you, will be doing. The tooling construction of the shoe offers some of the best comfort, breathability, and support in any water shoe and is perfect for the active man. It is lightweight, with quick-drying material and a non-marking outsole. The fit of the shoe is snug and it holds the foot in with great lockdown. The Traxion grip and rubber sole give you outstanding traction, from the beach to the poolside. The drainage of the shoe ensures that your foot remains dry and cool throughout your hike and the 360-degree climacool ventilation ensures your foot gets the airflow it needs. A top water shoe for the man who loves the outdoors and performing water sports, an EVA tongue construction, great drainage, non-marking outsole and traxion grip and rubber sole, coupled with the 360-degree ventilation on the shoe ensures your foot remains cool and dry and protected no matter where you find yourself. The Adidas Outdoors Climacool boat lace is the perfect shoe for your watersport wardrobe! These mens mesh walking water shoes are non-slip socks with a breathable mesh and leather upper that will ensure your foot remains stable and comfortable all day. The air mesh allows for great airflow and the leather adds to the durability of the shoe. Weighing in at less than 8oz this is one of the lightest around and will not weigh you down when wading through water. The upper has detailed stitching design with a soft feel, the Lycra net cloth makes it a very flexible shoe and it allows for great range of movement while keeping your foot stable in the shoe. The rubber outsole of the shoe offers you exceptional grip, helping you to navigate slippery and wet surfaces. They are also great beach shoes allow you to rid yourself of the sand as you walk through its great construction. These mens aqua socks are also walking shoes and they offer great durability, flexibility, comfort, and grip, allowing you to tackle rocky waterways, walk on the beach or around town if you like. Highly versatile water sports shoes with a slip-resistant sole to allow you to tackle any kind of surface area from wet and slippery to sandy. Ultra-lightweight so they will not weigh you down, great drainage holes so you will not get waterlogged and highly flexible for a great range of movement. One of the best sneakers styled water shoes on the market. 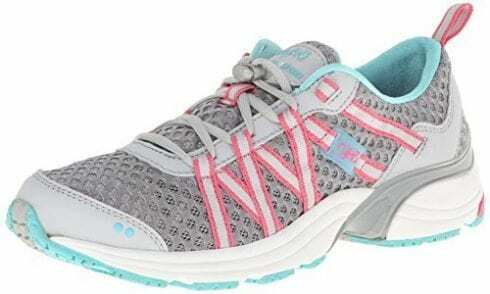 Like the Mens Merrell All Out Blaze Sieve, this women's shoe is designed for durability, comfort, and protection. Perfect for the women who enjoy the outdoors and especially water sports. Hiking with these shoes is a breeze, especially if you are going to have to deal with river crossings or wet and muddy surfaces, as they are known to be used as a replacement hiking boot. They are designed to shed both water and debris easily, keeping you stable, while the tightfitting nature of the water shoe allows for great agility and stability. The sole is ultra-flexible to allow you to move easily over any kind of terrain while keeping your foot protected at all times. The waxy waterproof leather and lycra fabric uppers feature a neoprene stretch collar to allow you to remove the shoe easily and the M-Select Fresh antimicrobial agents in the lining of the shoe reduce the odor that is associated with water shoes. Traction and stability are provided by the Unifly Midsole, which allows your foot to remain in contact with the surface at all times and the 3mm lug, depth ensure the best traction on any surface. The waxy waterproof leather and Lycra fabric uppers all for great drainage of water and prevents debris from attaching to the shoe, the neoprene stretch collar allows for easy on and off. The Unifly midsole keeps your foot in contact with the ground keeping you stable while the 3mm lug depths offer superb traction. This canvas sneaker athletic water shoe is attractively designed and engineered to be used both in and out of the water. 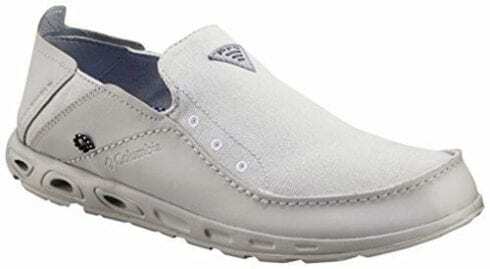 These slip on water shoes are also designed to accommodate people with wide feet, are lightweight and very flexible. There are a number of features on this great water shoe that make it perfect for the outdoors man who loves performing watersports. If you're looking for gift ideas for the water sport lover in your life, you've found it! A venting midsole will allow not only for superb airflow but also allow water to escape the shoe easily. The Techlite midsole is also cushioned to offer comfort. It is lightweight and easy to drain. The razor traction and Omni-grip non-marking outsole that offers excellent grip on any surface and makes it perfect for use in or out of the water. The Columbia mens product is a great looking water shoe that can be used as a swim shoe, beach shoe or boat shoe, offering excellent traction, comfort, style, and support in any environment. An athletic water shoe that is designed for both in and out of water use. The Techlite midsole offers great cushioning and superb comfort, while the razor traction and omni-grip non-marking outsole ensure that you remain stable on your feet no matter what the underfoot conditions. Lightweight, flexible and comfortable perfect for any water activities. When deciding what shoe you need to tackle hikes that involve crossing rivers or dealing with any type of water hazards, or when you want to go swimming but are not sure of what is to be found on the surface of the pool or in the sea, you need a great water shoe to offer you the protection, support, comfort and stability you need in these types of circumstance. With our water shoe buying guide, we hope to help you find your next pair of water socks! When deciding what type of water shoe you require you need to consider a view vital areas on the shoe. This is one of the most important aspects of a water shoe. Walking on surfaces that are slippery and wet require great traction to ensure you remain stable on your feet at all times and under all circumstances. These types of shoes are designed to be worn when walking along the banks of rivers and lakes, on slippery rocks along the beachfront, or even next to your swimming pool. A topwater shoe will offer a closed toe design; this will ensure that your toes are protected from any hazards below the surface of the water that you cannot see. It prevents you from stubbing your toes, or worse, ripping off your toenails by accident. This is a very important aspect of any water shoe. Water shoes are also designed to allow the water to escape the shoe and not to hold it in the sole of the shoe. This prevents your inner sole from getting slippery and causing your foot to slide in the shoe which can also damage or injure your toes. Topwater shoes do vary depending on the brand you choose however they almost all offer a top-of-foot protection, which sandals do not as a whole. This type of protection is vital on a water shoe as it prevents scrapes, bruises and other injuries due to you walking on unseen terrain when walking in water, or on rough and varied terrain on land, as well as protecting the foot from objects being dropped onto it. 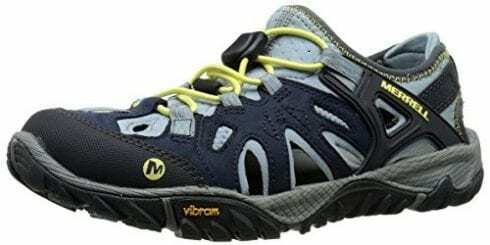 The traction that these kinds of shoes generally provide make them superb, if limited, hiking shoes that are perfect when hiking trails that involve dealing with water, either lakes, dams, streams or even along the seaside. The uppers of the water shoe are usually constructed from materials such as mesh or leather. These are very lightweight, allow water to pass through them or are waterproof to a large degree. They also are extremely durable and can withstand being wet without being damaged. Canvas is another great material for water shoes. 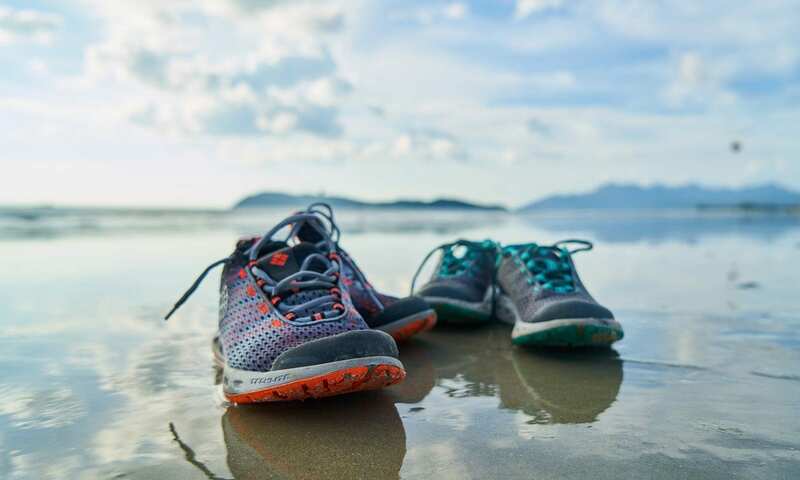 Although water shoes are specialized in nature there are a few brands that do make them and there is a selection of styles and colors available, all be it limited. In comparison to other footwear, the styles are limited as they are not as popular a shoe as other athletic footwear. However, you can find great water shoes in slip-on and sandals. You can get both low top and high top water shoes depending on what kind of water activities you are planning to do. The sneaker styled water shoes are often used as a kind of hiking shoe, especially if you are going to be encountering water, or wet slippery surfaces on your hikes. The styles of closure on these shoes tend to differ, laces are avoided due to them tending to get heavy when wet. There are some shoes with elastic lace closures on the market and these are quite popular as well. 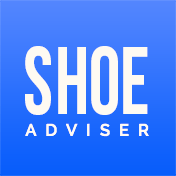 This is another very important aspect when choosing your shoe. The reason is that men and women have different feet, not only in size but also in shape and the way that they tend to walk on their feet. The best brands recognize this and have created gender specific water shoes that cater to the needs of males and females in their own unique way. Women tend to have narrower feet than men, as well as having more sensitive toes and midsoles. Men, on the other hand, have wider and larger feet than ladies. As you can see there are many different aspects of a topwater shoe, and selecting the one that will most benefit you, depending on your particular needs is important. Any person who loves water sports will wear a water shoe. These are specifically designed shoes that offer superb traction, great foot, and toe protection and are usually made from mesh or leather materials, making them highly breathable and able to shed both water and debris easily. Most water shoes will have a very close tight fit so that they can provide the support you need when wading through water. Their soles are hard yet flexible in order to give your foot a good range of motion. Water shoes will usually have a closed toe and will cover the top of your foot, they provide protection for your feet when you are engaging in any kind of water sport such as swimming, diving or water skiing or kayaking. They are also used as beach shoes and limited hiking shoes, especially if you are going to be hiking were crossing rivers or streams is likely. You can get different styles of water shoes such as water sandals and athletic styled sneaker water shoes. Water shoes will usually fit you like a glove, keeping your foot secure at all times and allowing for a great range of movement. Water shoes are versatile; they can be used comfortably in or out of the water, and are perfect for any hiker, fisherman, kayaker, water skier and the like. Water shoes are perfect for any person who will be engaging in any kind of water sports. You get quality water shoes, water sandals and the like that provide the kind of traction you need when walking in water or on slippery and wet surfaces. There are a few activities where water shoes are perfect for use. These include water skiing, surfing, white water rafting, hiking in areas where there will be river crossing and the like to contend with, floating or kayaking down rivers, spending time on the beach, especially when you are planning to go walking on the rocks. You can also use your water shoes when at the swimming pool or ice fishing at the dam. The great versatility of these shoes makes them just as at home in or out of the water. The great traction provided makes them perfect for use even in your everyday life, such as walking around the mall. They are supremely comfortable and provide a great level of protection to your feet, so using them in any setting or environment is possible. It is vitally important to fit your water shoes correctly. They need to fit securely on your foot and not allow your foot to move around too much in the shoe. Therefore the fit should be tight and secure. Much like any athletic shoe, water shoes should mold to your foot, in this way it is able to give your foot support. In the case of water shoes, this is even more important as they need to be able to shed the water and not become waterlogged; they also need to ensure that your feet remain as dry as possible and protected from any unseen objects below the surface. Therefore it is important that you try your shoes on and ensure that your foot fits snugly in the shoe to be sure that they will not come off while walking in the water, especially on muddy riverbeds, or in the sea. Most people tend to choose a great water sandal when selecting the water shoe that they like to wear at the beach. This is because they are less closed in than a sneaker styled water shoe. The important aspect of a water shoe that you will be using at the beach is the kind of protection the shoe will give you against broken shells, slippery and sharp rocks and a myriad of other dangers that lie beneath the surface, especially in rock pools on the beach. The top water shoes for the beach will fit snugly and be secured properly with no possibility of slipping off. The fit should be fairly tight to ensure that you have a full range of movement, especially when walking on rocks at the beach. The sole of the water shoe needs to be not only thick and protective but also be flexible enough to allow your foot a great range of motion to be able to keep your balance and grip when walking over slippery rocks. 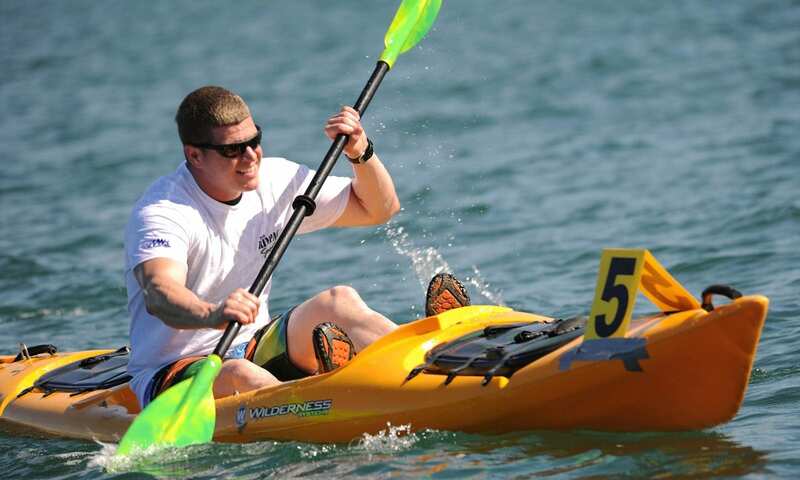 If you are going to be kayaking, it is vitally important that you get one of the top water shoes; it will make a world of difference to your experience. Putting on an old pair of tennis shoes will leave you with soggy socks and shoes and make your feet feel squishy and uncomfortable. Just like you will be needing sunscreen to protect you from the sun when kayaking so you will also need some water shoes to protect your feet from the dangers that lie beneath the surface of the river, dam or even ocean you will be kayaking in. Most water shoes, from water sandals to booties will be appropriate footwear when kayaking, however, the athletic styled water shoe is by far one of the most popular. Selecting the right shoe with the perfect fit will make all the difference. You need a shoe that fits comfortably on your foot and will not slip off at any time. The water shoe should shed water and be lightweight, not get waterlogged or weigh your foot down in any way. The soles of the water shoe need to be thick and flexible to allow for easy portage if needed. This usually involves crossing rocky surfaces so a sole with traction and one that protects your feet is important. The type of water shoe that you prefer is up to personal choice and there are many brands that make these specialized shoes. Whether you choose a water sandal or a water shoe, choosing the one that fit perfectly suits your personal style is the one that will be your topwater shoe for kayaking. When you take on a challenging hiking trail that involves river crossings or other water hazards, if you like to go fly fishing or boating, or if you love walking on the rocks on the beach, then you need a great pair of water shoes aqua socks or even some top-rated boat shoes that will offer the protection, comfort and flexibility as well as the ability to drain the water quickly and allow your foot to breathe and remain cool and dry at all times. Crocs have always been well known for their superb quality and durability and their Men’s Crocs Swiftwater Sandal is no exception to this rule and out top choice for 2019. They are one of the best water sandals on the market with a mesh upper that is easy to clean, highly flexible and will be able to handle any environment, perfect for use in and out of the water. They are lightweight and will not get waterlogged when wading, and the hook-and-loop closure of the sandal ensures that it remains securely on your foot at all times, keeping you protected no matter the hazards underfoot. The ports on the Crocs swiftwater are located strategically in the upper of the water shoe are designed to allow them to shed water and debris easily, being extremely flexible the shoe allows for a great range of foot movement that offers superb grip and stability when walking on any surface. The Croslite foam construction of the shoe is designed to avoid absorption of water and the herringbone grooves on the outsole provide for superb traction. With all these features comes a very comfortable fit with a little wiggle room to allow your foot to rest snugly and the odor-resistant qualities allow your foot to remain fresh at all times. Hiking can be challenging and even more so if there is water involved. Having a great hiking water shoe that will allow you to cross rivers, wade through dams and tackle any other hazard that may come your way is priceless. Constructed from a waxy leather fabric with Lycra this shoe is waterproof and it is also highly flexible and offers great drainage holes to ensure that your foot remains cool, dry and protected at all times. Lightweight it offers a snug fit to allow your foot a great range of motion and with the Unifly midsole, it allows you to remain in contact with the surface keeping you stable on your feet. The open design of the water shoes allows water to flow out freely. These are extremely easy shoes to put on and remove with a neoprene stretch collar that also allows the shoe to lock your foot in. The shoe also offers M-Select Fresh with antimicrobial agents to prevent any odor. Easy to clean, easy to wear and one of the top water shoes on the market for water sports enthusiasts and hikers, make this our premium choice. Getting a top water shoe does not mean having to pay top dollar and the ALEADER Mens Mesh Slip on water shoe is a prime example of this and why it is our great value choice today. Constructed with a lightweight mesh material that is not only breathable but also extremely fast drying they are sure to keep your feet cool and dry no matter the circumstances. Engineered as an amphibious shoe, it copes equally well in both wet and dry environments. Hydrophobic properties in the upper material along with the stitched lateral support system, that will lock your foot into the shoe, will ensure that your foot remains secure in the shoe and keeps it dry at the same time. FluidFlow technology is what ensures that the shoe is able to drain all excess water via the sole outsole of the shoe and the Solyte midsole is flexible and lightweight to give you great energy return. The ComforDry sockliner is there to provide the cushioning. The traction on this water shoe is superb. The rubber pods provided on the high wear areas ensure that no matter the surface you are walking on, from slippery and wet to rocky and sandy, you will always get the grip you need. We hope you enjoyed our article on "The 10 Best Water Shoes for Rocky Beaches, Kayaking & more! ", if so, please share and rate it.